Ask anyone from the Eastern Mediterranean who makes the best baklava, and chances are they will answer "we do" (that is, if they don’t answer "my grandmother"). Apart from bread, there is probably no single foodstuff in the world that engenders as much loyalty to regional versions across so many countries as this iconic pastry. The specifics may vary, of course – some use walnuts, others pistachios; the flavoring can run through the gamut of the spice rack and beyond; the form can be triangular, cylindrical, diamond or square, but the principle is the same: tissue-thin layers of dough, brushed with butter and stacked with nuts, baked until crisp and golden, and then drenched with fragrant syrup which seeps through the cracks, penetrating the layers until every bite is a wildly alluring interplay of crunchy and soft, spicy and sweet, rich and, well, richer. Though wars may be waged over the finer points of its construction, in my opinion the differences are academic, since no matter what form it takes, baklava is one of the most unbelievably delicious things ever to grace a dessert plate. Baklava is also one of the most well-documented and ancient desserts ever to grace a plate, with a timeline traceable back nearly three millennia. The story of baklava begins around the 8th century BC in northern Mesopotamia, when the Assyrians are reported to have layered crude pieces of bread dough with nuts and honey before baking them in wood-burning ovens. We can thank the Greeks, however, for inventing a method of rolling the pastry dough into paper thin sheets appropriately called filo, meaning “leaf”. By the 3rd century BC, there are records of baklava being served in wealthy Greek households for all kinds of special occasions, as well as being prescribed as an aphrodisiac, for the walnuts and honey they filled it with were believed to incite more than just gastronomic passions. The sweet also spread into the wealthy households of the ancient Persians and Romans, and then journeyed to what is now Turkey when the Roman Empire moved east to Constantinople. Many believe, however, that it was during the four hundred years that the Ottomans controlled Constantinople that baklava reached its apogee, as the kitchens of the Imperial Palace became the ultimate culinary hub of the empire, and Armenian, Greek, Persian, Egyptian, Hungarian and French chefs were brought in to add their particular touches to the refinement of the sultans’ favorite dessert. These days you could easily draw a map of countries from Sofia to Tehran based on recipes for baklava. In the Balkans the recipe usually calls for walnuts, and particularly in Greece they like honey, cinnamon and cloves spicing up the mix, whereas in the Levant pistachios and a touch of lemon or orange blossom water are more to people’s taste. Turkey, straddling Europe and the Middle East, is home to many different variations including a famous hazelnut version that many are partial to; likewise the pastry chefs in the southern city of Gaziantep are particularly renowned for their version incorporating a thick paste made from milk and semolina. Moving deeper into the Arab world and Iran, the recipes call for heavy doses of rosewater and cardamom, and almonds are often the nut of choice; here the shapes and sizes are also much more variable. In all these places the baklava can be preferred ‘wet’ or ‘dry’, thick or thin – the only thing people seem to agree on is what it shouldn’t be: soggy, greasy or overpoweringly sweet (though this last one is, naturally, often subject to creative interpretation). Baklava is surprisingly easy to make, and even more surprisingly easy to eat. It is, for example, one of the few foods that cause my tastebuds to short circuit my other cognitive functions – at least, that’s the only explanation I can give as to why my fullness receptors and calorie concern seem mysteriously out of order whenever it’s placed in front of me. In my version of this irresistible sweet, which doesn’t adhere to any particular tradition but my own tastes, simplicity is the key to perfection. Without heavy spicing or additional fillers, the rich voices of the butter and nuts sing clearly, supported only by a subtle and well-trained chorus of fragrant cardamom and the barest hint of honey. You’re welcome, however, to treat this recipe as a blueprint for your own favorite flavors. For example, you could easily substitute another nut for the pistachios if you prefer; likewise, the syrup can be customized to your taste, perhaps with more or less honey, with other spices or with flower essences. And who’s to say you can’t go completely untraditional and put some dried fruit, vanilla or liqueur inside? The only thing I would not recommend is skimping on the butter or the sugar – even if you have to diet for a week before and after eating it, the taste will be worth it. I will, however, give you one piece of dietary advice: do as I do and insure you have plenty of people around when you pull this out of the oven. Not that the thought of others witnessing my lack of self-restraint actually deters me where baklava is concerned – on the contrary, I just count on baklava having an equally compelling effect on everyone else so that it disappears before my own gluttony can cause too many heads to turn. Yield: Makes about 24 pieces, depending on how you cut them. Note: Although baklava is best made in a heavy metal pan, you can use glass or ceramic as well – however reduce the oven temperatures by 25 degrees if you do. Prepare the syrup first. Put the sugar, water, honey and cardamom in a pan and boil gently for 5-10 minutes until the syrup thickens just enough to coat a spoon. Stir in the lemon juice and simmer for a few seconds more. Allow to cool, then chill in the refrigerator. Look at the syrup when it has cooled – it should be thick but still flow easily. If it is too viscous and sticky, add a little water, warming it if necessary, and letting it cool again. Fish (or strain) out the cardamom pods. To clarify the butter, melt it in a small saucepan over medium heat and bring it to a gentle boil. Boil without stirring until a layer of foam has risen to the surface and the white solids have sunk to the bottom (don’t let the solids brown). Skim off the foam as best you can, then decant the golden liquid into another container, leaving the solids behind (I normally strain it through a cheesecloth while doing this). Discard the solids. Keep the clarified butter warm. Pulse the pistachios and sugar together in a food processor until finely chopped but not pasty. Set aside 1/3 cup of the nuts for garnish, if desired. While you’re working with the filo, keep the stack covered with a damp towel so it doesn’t dry out. Brush a large square or circular baking pan, a little smaller than the sheets of filo, with butter. If the sheets are much bigger than the pan, trim them to fit (a little too big is better than too small – just let them come up the sides of the pan). Lay twelve sheets, one at a time, one on top of the other, in the tin, brushing each generously with clarified butter, pressing the filo into the corners of the pan. Spread the nuts evenly over the sheets. Fold over any pastry that extends over the top of the nuts. Then cover with the remaining sheets, brushing each, including the top one, with melted butter. With a sharp-pointed knife, trim the top layers so they fit perfectly in the pan. Cut parallel lines about an inch and a half apart, then cut other parallel lines diagonally so as to have diamond-shaped pastries. Cut right through to the bottom. Preheat the oven to 400F/200C (see note above). Bake the baklava for 10-12 minutes, or until it begins to brown slightly. Remove the baklava from the oven and pour over any remaining butter (reheat it if it’s not still liquid). Reduce the oven temperature to 325F/150C and bake for about 1 hour more, or until it is puffed up and golden all the way through. Remove from the oven and immediately pour the cold syrup all over the top of the hot pastry, concentrating on the gaps. Return the pan to the turned off oven and let sit, with the door closed, until most of the syrup has been absorbed, about half an hour. Sprinkle on the reserved pistachios, if desired. Cool completely to room temperature before serving. It actually tastes best if you leave it out to ‘ripen’ overnight, covered with foil. Due to the use of clarified butter, this will keep well for at least a week at room temperature. It has never lasted that long around me, however. I love baklava. I’ve made it a few times, although not recently. It is perfection. I prefer to make mine with pistachios and a little orange extract in the syrup. BTW: Love you site, recently came across it and have been directing folks. Lovely photos and great writing, I can only hope to refine my skills to this point some day. THANKS! oh my god, that is the most beautiful baklava i’ve ever seen! unfortunately i’ve never had a proper baklava, only soggy or over-sweetened ones from bad bad places. but thanks for the recipe! now i can just make it at home. hopefully it comes out as pretty as yours. Holy cow, that looks amazing! I live down the street from a Greek Orthodox church that throws a massive festival in the parking lot every year in Sept. As a thank you for to all the people on our block for dealing with parking hassles, they hand distribute the sweet, delicious little homemade triangles of goodness. As good as it is, your photo look so much better! The first time I had baklava I hated it. Too sweet, too nutty, too everything I thought. Actually it was just a poor version I ate. When I had the real thing I loved it! Btw excellent photography. So come on!! How many pieces can you really eat all at once?? What is the max? ?Funny coincidence to read this great, once more, post Melissa. I made a carrot dish yesterday with filo pastry too and as I had plenty of filo pastry left -always the case- I spent last night in bed flipping through the pages of my magazines. And I found amazing desserts with it. BUT none looked like yours! SO my next question is, can you send me some? I promise I will be decent and only require a small amount. Although I find baklava way too sweet, I do like it in small quantities every now and then. I’ve been thinking about making it myself, but have been confused with all those different recipes that I’ve come across. Thanks for your lovely post, I can now proceed with the definite version;) Being on pistachio mood recently, yours sounds exactly right. I can’t imagine a better looking baklava than this – and I can’t imagine pulling it out of the oven and SHARING! No way! Mine!Ok, I do share. Reluctantly.I love this post, as usual! 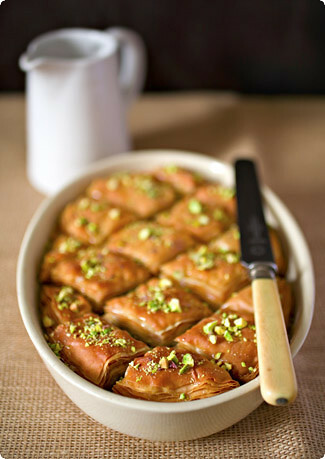 Baklava is such a wonderful treat, and feel inspired to make after reading your entry above. I too recently stumbled upon your site, and commend you on the crispness of your pictures and well written essays. The first time I tasted baklava, at a Greek restaurant, as a little girl, I was bowled over. I simply could not believe anything could be so delicious. I think I went on about it a little too long for my adult companions.Unlike some childhood passions, this one has stayed with me. I adore baklava, and like many versions, but pistachios are present in most of my favorites. These look wonderful. Your posts always make we want to cook. Tried your French Olives cookies and they were delicious. Only thing is they werent crisp like how the ones in the photo look like…what did I miss ? Yeah .. share … wassat? I would run off with the baklava and hide in a corner eating it all! They would never last a day around me, what more a week! I love Baklava! Thanks for the info, history and recipe!! Lovely post, and oh what a tempting photo! I was aware of the many different varieties of baklava, but knew nothing of its history. How I want just one square RIGHT NOW! Lovely to read this post. It made me smile because many moons ago, the moment I finished my very last exam at Edinburgh, I shunned the other students guzzling champagne outside the hall, and instead sprinted to the wholefoods deli and bought myself a pack of baklava… I thought I would splurge and eat the whole packet – I think I only managed 2 and a half pieces. They were sinfully divine though, and a wonderful way to celebrate! Wow, amazing stuff & totally agree on how wonderful baklava is, recently had a really really great one flavoured with rosewater at a restaurant on the Great Ocean Road in Vic, have been thinking abt it ever since & might make a trip back jsut for the baklava, or then again I could just try & make my own as you make it sound so easy! Hi Scott – Thank you for all your kind words and uncompensated PR work 😉 I’ll have to try orange extract in the syrup, thanks for the tip!Hi Yoony – I’ve had my share of bad baklava too, unfortunately. I certainly hope this recipe helps to make up for all the bad ones!Hi L – Thank you! I must say, if I had a Greek Orthodox church throwing parties on my street and handing around free baklava, I probably wouldn’t bother making my own, but we can’t all be so lucky, can we? ;)Hi Ashwini – I can fully sympathize — If my first bite of baklava had been as bad as some of the worst I’ve tried, I might have never tried it again. Luckily it was good, and I’ve been hooked ever since!Hi Bea – Ha ha, I can’t tell you that! Classified information. Let’s just say I have been known to eat it three meals a day when it’s around 😉 And I would be happy to send you some next time, providing it survives the trip to the post office (I might get hungry along the way, you know! )…Hi Plum – Wow, baklava with figs sounds pretty decadent! I’ve never actually had the bird’s nest you mention, though I’ve had other rolled versions. I’ll definitely keep an eye out for it!Hi Pille – I have that problem with many baklavas too, but I think you’ll find that this recipe isn’t as sweet as many others. And if you’re worried, just use less syrup! I look forward to your report :)Hi Malka – Wow, okay, I’ve just added ‘barma’ to my must-try list too… Hi Tülin – I’m glad you approve! I did read several Turkish recipes that included the step of making the dough by hand. I would like to attempt it some day, as I’m sure it gives a much more delicious result, but in the meantime I think filo dough is a pretty good substitute. Tell me, is the dough difficult to make?Hi Matt – It does require willpower, and that’s not something I ususally have in abundance! But hey, if you want to make this all for yourself, I’ll be happy to turn a blind eye – that is, as long as I get my cut!Hi Demetrius – Thank you, and I’m delighted to have inspired you!Hi Lindy – You and me both! I’ve been battling a life-long obsession with it, though I only started making my own recently. And pistachios, in my humble opinion, are the only way to go – you are obviously a woman of impeccable taste :)Hi Sonali – Hmm, mine were indeed quite crisp. The only thing I can think of might be to increase the baking time, or else perhaps make them thinner?Hi J – You’re making my mouth water just with your description. I think I have to make a rosewater version soon myself…Hi Zarah Maria – Oh, I would be so tickled if I managed to win you over to the baklava-lovers side! Don’t worry, we’re a friendly bunch over here :)Hi MM – Ha ha, I know the feeling! I’ve even been known to hide the leftovers and lie about their existence to anyone who asks…Hi KT – You’re more than welcome!Hi Tania – Thank you! I wish they had already perfected the taste-o-vision system, but it looks like you’ll have to go out there and hunt down a piece on your own…Hi Kookiegoddess – Wonderful, an Edinburgh alum with a taste for baklava! My favorite place to buy it is a brand new Turkish grocery that’s just opened about a ten minute walk from George Square, though I must say there’s no shortage of it anywhere in the city!Hi Ange – It is amazingly easy, trust me! I heartily encourage you to try your hand at it and tell me how it compares with your ‘Great Ocean Road’ gold standard. I wish I had known where to stop for baklava when I drove along it myself several years ago! Hi Melissa, thank you for responding every comment individually:-) The dough is not difficult at all to make, but the process of thinning the dough is the tricky part. However, I saw it made by the same device we use for thinning pasta dough. Normally we use a thin and long rolling pin to prepare filo. Of course it is a time consuming process, thining 30-40 pieces one by one; so we just roll them out as the size of a serving plate, then put ten pieces, one over the other with additional flour-starch mixture in between, and roll them out all at once. The starch-flour mixture prevents them from sticking.The rest is the same as you read in other recipes. Thank you again, for including baklava in your beautiful site. What a beautiful Baklava :)Such an enjoyable and informaive post to read.Food and culture are always there for each other :)Keep it up! Nicely done. I do appreciate when a baklava has been done justice. There are many variations from the different regions and I embrace them all…just make them well, I say!